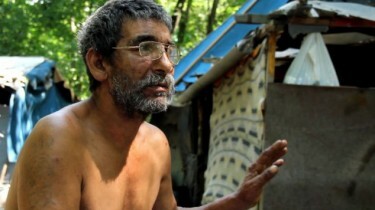 Some 45-50 people living in makeshift shacks in the abandoned woods alongside Fehér Road and Terebesi Road in the capital of Hungary, Budapest, were called upon to leave their homes at short notice in June 2012. Some of the residents, who have been living in their shanties for decades, have built up self-supporting farms, while some have been trying to make their living from collecting and selling scrap-iron. Rumours spread years ago that the city was planning to build a recreational park in the area. Residents told atlatszo.hu's journalists that social workers from the Red Cross and the Baptists informed them about the eviction and offered places in their shelters. Civil rights movement A Város Mindenkié (The City is for All) criticized the forced eviction as illegal and noted that people would be provided with worse housing than the existing one. Albert Jónás, a shantytown resident. Photo by Atlatszo.hu. On their blog, they wrote [hu] that the municipality provided two weeks to local social workers to find a place for these 50 people. They noted that homeless shelters were not proper alternatives, since the homeless can only spend up to two years there and without any income they, again, wouldn't have a place to go to. Atlatszo.hu’s investigation [hu] has shown that social workers were asked to “solve this problem” by the District X municipality to help a real estate investment. As Deputy Mayor Tibor Weber informed atlatszo.hu’s journalists, investor Sidi Group’s plans to build 900 apartments, offices and some recreational areas are now in an advanced stage of authorization. Civil rights protests and increased media attention appear to have prolonged the eviction, which now seems to have turned into a lawful and negotiated procedure. Many of the inhabitants have moved out to shelters, some are still staying there, but the process is unstoppable for now.